Gate or Westgate Castle in Weardale was a defensible building that formed a hunting lodge at the west gate of the Bishop of Durham's hunting park (Stanhope Park) in Weardale. The site of the building lies within the village of Westgate and on the east bank of the Middlehope Burn. Historical Notes: The Castle is thought to have been founded by Bishop Bek c. 1300; in 1442, after the Bishop's hunting parties ceased, it was granted to Thomas Lumley, and used as an administrative centre and occasional prison. Surviving accounts show that in 1470, the gatehouse was re-roofed with stone slates. John Leland writing c. 1546 saw the Castle as a 'praty square pile'. In 1559 it consisted of a great chamber and some lesser ones, a hall, buttery pantry, stables and outbuildings and had a lead roof. A description of c. 1590 describes it as 20 yards long by 10 yards broad, with an attached gatehouse measuring 5 by 3.5 yards; the windows comprised 'eighteen lights' and there were nine doors; the fact that only one floor is mentioned suggests that it was no more than two storeys in height. Later references are primarily to the decay of the building; in 1647 it is described as 'now demolished' leaving 'ruines and the bare walls only'. 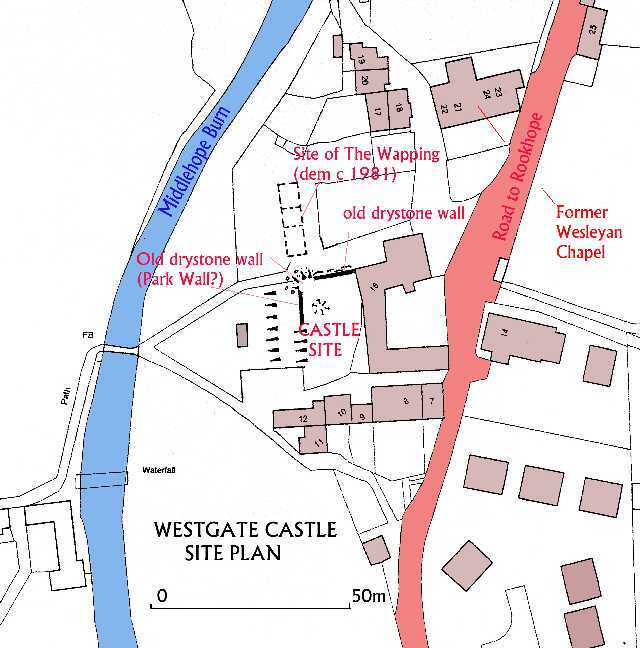 A sketch map of c. 1800 shows a simple rectangle labelled 'Castle the only depiction of the building traced. 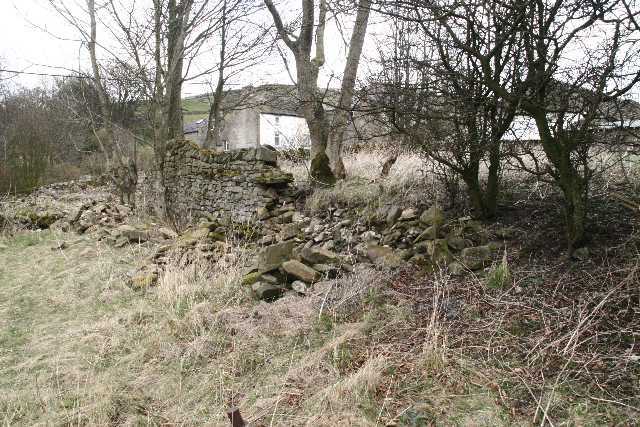 The last upstanding remains are thought to have been demolished when the adjacent school was built in 1819. Description: The site comprises two small walled fields covering an area roughly 30 m east-west by 20 m north-south. 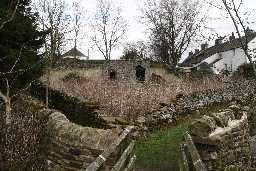 The eastern field forms the top of a small hill, and is relatively level; it is bounded by an old drystone wall on the north, at the foot of which a public footpath runs east-west, roughly 2 m below the level of the ground inside the wall. One small hollow towards the north-west corner of the area may be the result of 'cursory digging by a local person in the early 1980s' which revealed only lime and plaster. A similar field wall on the west runs for a few metres then fades out, with a steep scarp following the line instead. Where the two walls join, at the north-west angle of the upper field, there has been a recent collapse, exacerbated no doubt by the roots of a large tree growing nearby. 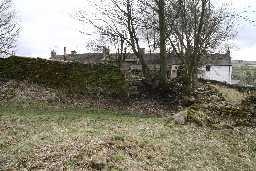 To the west of the upper field are the buildings of the slaughter house, set at a lower level, and on the south a retaining wall behind a row of 18th and 19th century cottages. In the western field the ground falls steeply westward, towards the Burn. To the north, beyond the public footpath, an area of piles of rubble and mounds indicates the site of a row of three old cottages, The Wapping, which local tradition linked with the Castle. A small excavation carried out in 1981 adjacent to the rear wall of The Wapping showed that the wall was pre-1800, and that there were remains of an earlier underlying wall. It seems likely that the upper of the two fields conceals buried remains of at least part of the site, although the slaughter house to the east has probably caused some degree of destruction. The local antiquary Morley Egglestone wrote in 1899 of 'foundations and some arched vaults now covered up'. 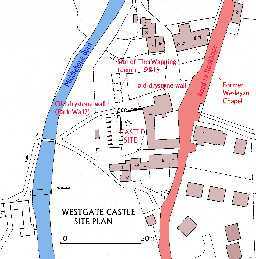 Weardale Historic Settlement Pattern: Westgate.